S.C.&S. 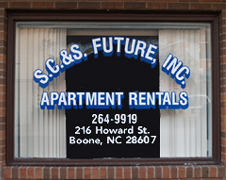 Future, Inc has been in the Apartment Rentals business in Boone since 1971. We have grown from one house with three apartments to approximately 115 revenue (mostly apartments, some commercial, and a few laundry) units. Our primary objectives have always been Service, Location, and Reasonable Rents. © 2015 SC&S Future, Inc. All Rights Reserved.